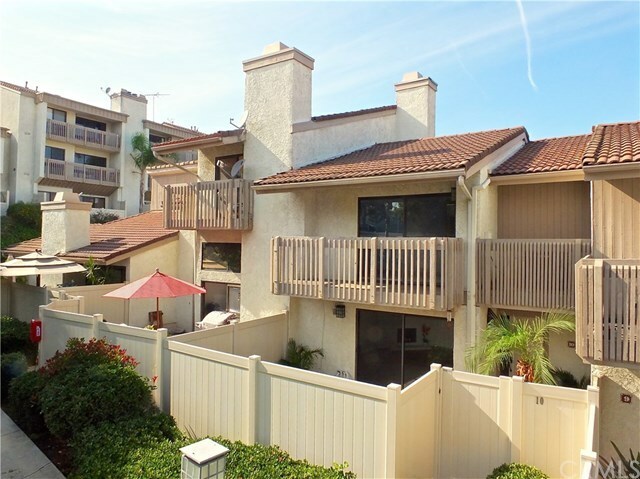 1821 Caddington...unit 10...a stunning trip-level 2 bedroom 2 bathroom townhouse quietly tucked away in Rancho Palos Verdes. Featuring an amazing open & spacious architectural design including a fireside living room, a dining room beneath a soaring ceiling and a nicely appointed kitchen with, new stainless steel stove, dishwasher, trash compactor and microwave. All new flooring, new kitchen counters and fresh paint throughout. The guest bathroom is convenient to the den/bedroom at mid level affording tremendous possibilities. At the penthouse level is the master retreat posting a vaulted ceiling, walk in closet, a private bathroom plus a treetop balcony. Other great features include brand new HVAC system and 'the nest' thermostat,.....,an oversized finished garage with laundry and storage, a private garden courtyard plus resort like grounds and a sparkling pool. Only moments from Trader Joe's, gym and movies theater plus a short drive to the waterfront, Point Fermin and the spectacular Southern California coast on the Palos Verdes Peninsula.. LaPointe.